Once Upon a Time in Nazi-Occupied Italy: Jacques Tourneur's "The Flame and the Arrow"
Lewis Stone ... Dr. Daniel Kalbert Harris, Sr.
James Mitchell ... Dr. Daniel Kalbert Harris, Jr.
Take your choice ... either I speak ... or my pistols do ! Josiah Doziah Gray: Perry puts me in mind of a colonel I had once. He never learned to protect his rear. According to TCM this was Joel McCrea's favorite film. 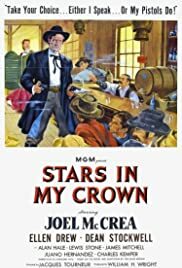 Of all the wonderful westerns that Mr McCrea appeared in this says a lot. I found this movie almost hypnotic. A picture of a time in America's past that has gone by the way side. Parson Gray,Played by Mr McCrea is what I would personally want a minister of the gospel to be like. Strong and courageous and committed to his calling. Juano Hernandez plays Uncle Famous Prill and was deserving of an Oscar for his courage in facing the racism of the day by the night riders or KKK of the day. This movie took the courage to show that not all white people hated black people in this day and age. Something I personally know to be true and factual.This was Alan Hale Sr's last movie. He died before this movie was released.John Kenyon,played by Dean Stockwell was an orphan living with Parson Gray and his wife,played by Ellen Drew. Stockwell gave such a performance that if Children didn't really behave that way in those days, they should have. Stars in My Crown is one of those lost treasures that has long since been forgotten. Any movie with a character named Cloroform has got to be special. Throw in Ed Begley as the man who try's to have a "Finger in every pie" and James Mitchell as young Doc Harris who comes home fresh out of medical school and runs straight into Slow(Typhoid)fever and at the same time falls in love with Lovely Faith Samuels played by Amanda Blake(of Gunsmoke fame).Theirs even a traveling medicine show featuring Professor Jones and his two companions who sing and play like a cross-eyed meadowlark. Wonderful movie that makes you feel better after viewing it which explains why I can easily watch it over and over.